The new 2009 Volkswagen Jetta Sportswagen now comes with the option of a 2.0 liter turbocharged clean diesel engine that gives you the ability to drive more miles between fill-ups saving you money. 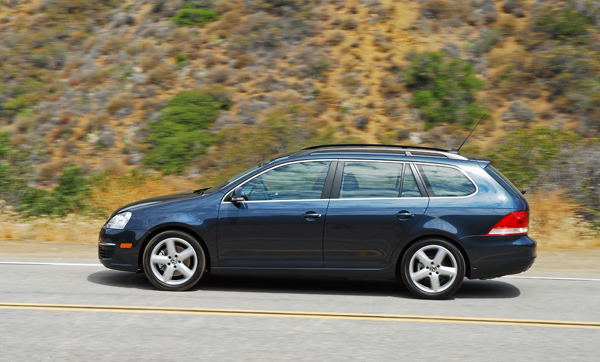 Volkswagen has taken its highly successful 2.0 liter inline 4-cylinder turbocharged diesel engine from the Passat line of sedans and wagons and gives you the option of enjoying its higher mpg and quiet operation. 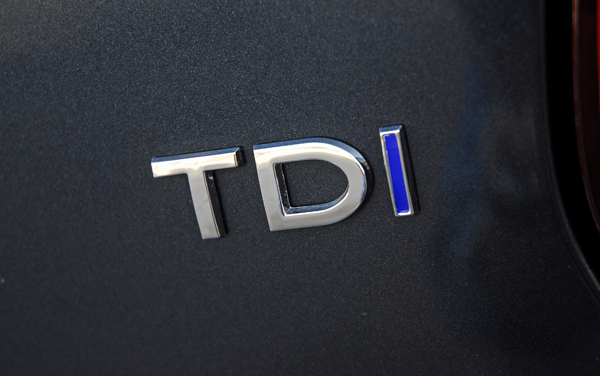 The clean diesel TDI is compliant in all 50-states and comes with a $1,300.00 Federal tax credit. 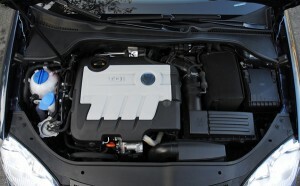 There is no compromise on power or torque either as this powerplant makes 140hp at 4,000rpm and a healthy 236lb.ft. of torque from 1,750-2,500rpm. That’s plenty of power and torque to easily move a family of five with cargo in the rear area and mounted on the roof. 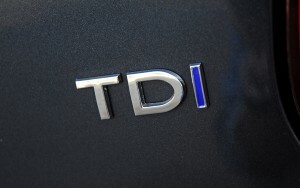 The 2.0 liter clean diesel engine TDI’s make use of VW’s advanced electronically control turbocharger and common rail direct injection technology. 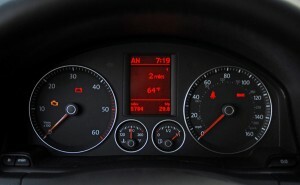 The engine is mated to either a smooth shifting 6-speed manual transmission, or a 6-speed automatic DSG transmission with Tiptronic that lets you keep the gear in drive or, when the situation is right, to manually change gears with a tap of the gear shifter or paddle shifters mounted on the steering wheel. The standard electronic differential lock helps minimize torque steer associated with front-wheel-drive vehicles. The new Jetta Sportswagen that I tested is perfect for young, growing families with its versatile and functional cargo carrying capability, money-saving EPA mileage specs of 30mpg/city and 41mpg/highway, and a base price of just $23,870.00. 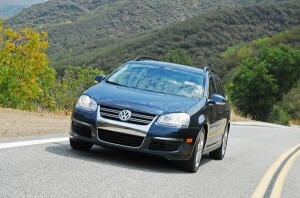 This fun and easy to drive sportswagen comes with VW’s fully independent suspension that features McPherson struts, coil springs, telescoping gas-charged shocks and a stabilizer bar up front; and a multi-link rear setup with coil springs, telescoping gas-charged shocks and a stabilizer bar in the rear. 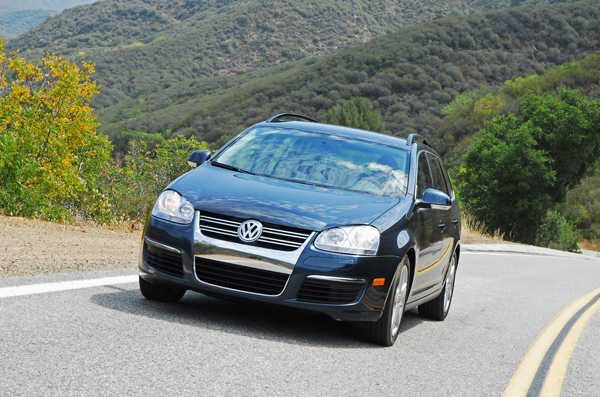 The proven VW electro-mechanical, power-assisted rack & pinion steering system easily moves you where you want the car to go with excellent feedback from the road with very good on-center feel. Keeping you on your chosen path are standard traction control, and electronic stability control. Quickly and safely slowing the new Jetta Sportswagen TDI down from speed are four-wheel disc brakes that feature 11.4in. vented discs up front, clamped with dual-piston calipers, and 10.5in. solid discs clamped with single-piston calipers in the rear. Keeping you in control during severe braking are standard ABS, Brake Assist and Electronic Brake Force Distribution. The Jetta Sportwagen TDI rides on standard 16X6in. alloy wheels wrapped with 205/55R16 all-season radials or you can option for 17X7in. alloy wheels wrapped with 225/45R17in. all-season radials. The styling is signature Volkswagen with a long, low, sleek silhouette with steeply raked A-pillars; a full-perimeter chrome strip wrapped around the greenhouse and flared fenders. The front fascia shows VW’s signature grille with chrome strips, a lower air-intake for the intercooler that has more chrome strips, and side air-intakes to cool the front brakes. Beautifully formed ‘cat’s-eye’ lamp clusters light up the night for safe driving. 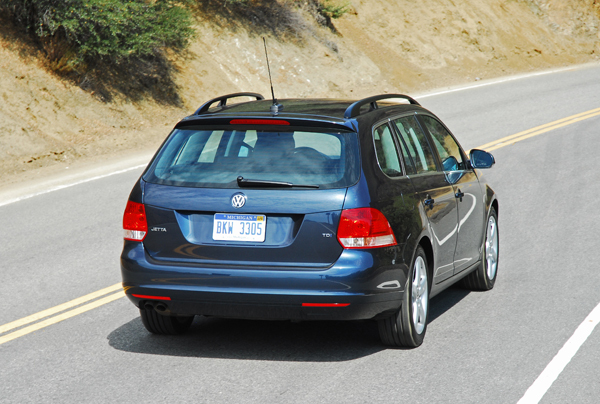 The rear shows large, wraparound lamp clusters, a big rear hatch for easy loading and un-loading, plus a spoiler mounted at the end of the roof. 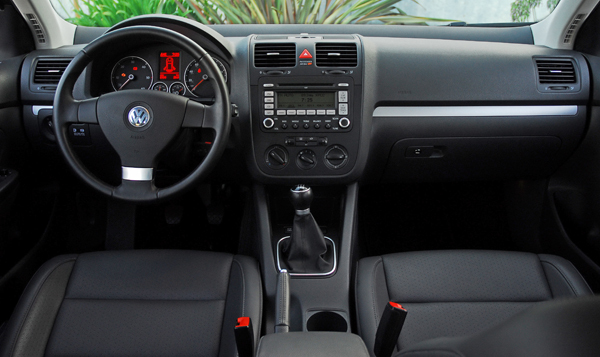 The large, comfortable cabin has seating for five and shows VW’s attention to detail with excellent materials such as the ‘soft-touch’ dashboard and doors that are nicely trimmed with aluminum pieces. 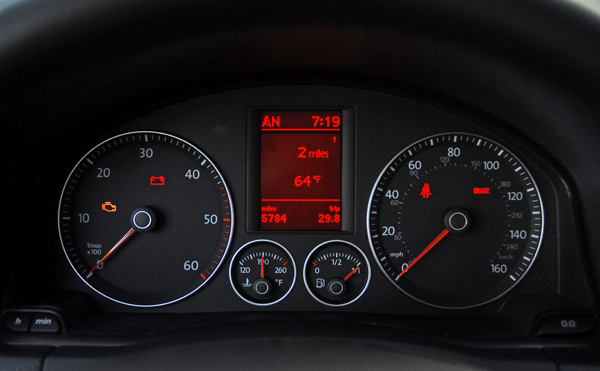 The instrument cluster is easy to see and understand, with all switches, dials and buttons within easy reach and fully illuminated for safe nighttime driving. The standard leather wrapped steering wheel features tilt/telescoping for the perfect reach and angle for easy driving. The center console is wide and deep to keep your personal items secure. 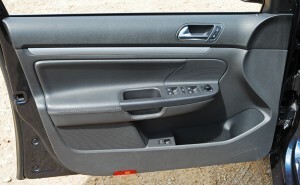 There is more storage in the locking glove box, door pockets and bin below the dashboard. The second-row seats feature a pull-down armrest with dual cupholders and storage plus the rear of the console has dual-air-vents to help bring warm or cool air to the back. a 12-volt plug, and a cargo cover. 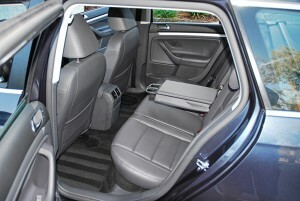 The second-row seats are split 60/40 and can easily be folded to enlarge the cargo carrying capability of the Jetta Sportswagen. Standard equipment not mentioned above includes Climatic single-zone heating/AC, V-TEX leatherette comfort seats that are comfortable and supportive, 8-way partial power driver seat with lumbar adjustments, rear seat pass-through, power/heated side mirrors, dual-lighted vanity mirrors, sunglass storage above, adjustable, intermittent windshield wipers/washers, power windows/door locks with all windows express up/down, cruise-control, rear windshield wiper/defogger, in-dash 6-disc CD with MP3 format AM-FM-Satellite Radio with six speakers, remote keyless entry, anti-theft alarm/immobilizer, multi-function trip computer, roof rack, front/rear carpeting with floor mats, dual map lights, and grab handles above each door. Options include a self-dimming rearview mirror, Bose premium audio system, VW’s DVD navigation system with a 6.5in. screen, Bluetooth communications, and a panoramic electric sunroof. 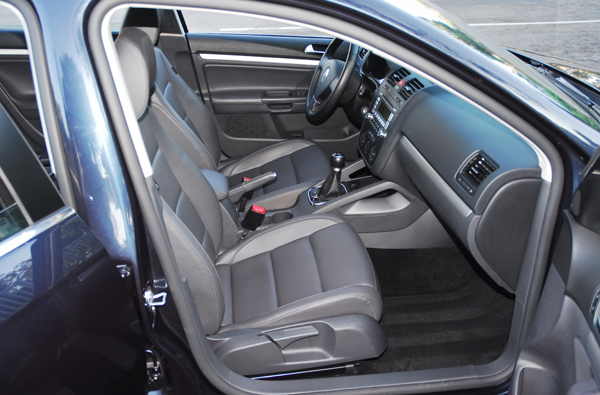 Standard safety features include driver/front passenger front/side airbags, side curtain head airbags front and rear, 3-point safety belts for all seating positions, head restraints for all seats, lower anchors and tethers for child seats, child safety locks in the rear doors, daytime running lights, side protection door beams, front/rear crumple zones, and a tire pressure monitoring system. The only safety option is rear side airbags. 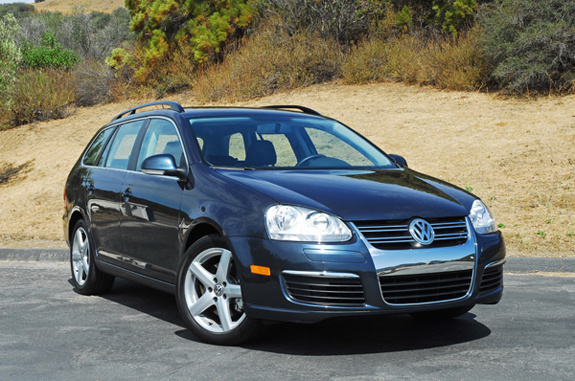 The new 2009 VW Jetta Sportswagen TDI is not only priced right, it comes nicely loaded with comfort, convenience and safety systems, a very practical vehicle and you’ll wave goodbye to filling stations as this vehicle can go up to 600 miles on the highway between fill-ups. I achieved 48mpg on the highway never exceeding 65mph, and 36mpg in the city by driving conservatively. Front Head Room: 38.4 in. Front Shoulder Room: 54.8 in. Rear Head Room: 38.1 in. 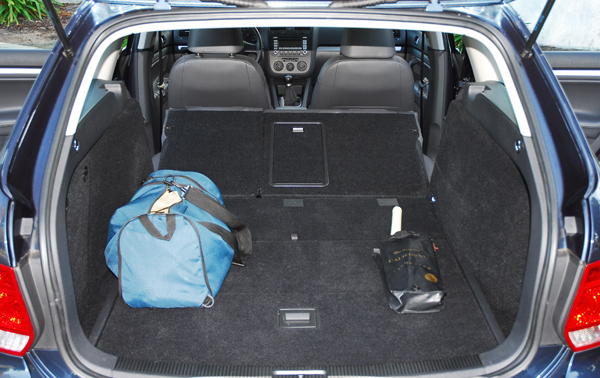 Rear Shoulder Room: 53.1 in. Rear Leg Room: 35.5 in. Luggage Capacity: 32.8 cu. ft. Maximum Cargo Capacity: 67 cu. ft.
Automatic: 420.5 mi. / 580 mi. / 478.5 mi.